As part of the Porsche motorsport track test at the Lausitzring, a select group of media representatives from around the world had the opportunity to compare the entire range of Porsche 911 racing cars: the 911 RSR, the 911 GT3 R and the 911 GT3. In glorious sunshine and temperatures of around 30°C, conditions at the Lausitzring were perfect for this extraordinary experience. Assisted by Porsche factory driver Kévin Estre, Porsche Young Professional Mathieu Jaminet and Porsche Junior Matt Campbell, 19 journalists from three different continents tested the flagship GTs developed in Weissach. Three reporters took to the track at a time, switching cars during short pit stops, while the next three journalists were briefed in preparation for their turn. During the briefing, the professional drivers each spoke about their own work: Factory driver Kévin Estre, originally from France, explained the finer points of the Porsche 911 RSR, in which he will be joining the starting line-up at the World Endurance Championship (WEC). His fellow countryman Mathieu Jaminet discussed the advantages of the Porsche 911 GT3 R, which the Porsche Young Professional drives in the ADAC GT Masters, in the VLN Endurance Championship and in other endurance races, most recently at Spa-Francorchamps. Matt Campbell, Porsche Junior in the Porsche Mobil 1 Supercup, introduced the fascinated guest drivers to the world of the Porsche 911 GT3 Cup. The response from the journalists was overwhelmingly positive: “I've never driven a car like the Porsche 911 RSR before. The acceleration is just incredible”, enthused Austin Wupei from China. British reporter Adam Towler was similarly enthusiastic about the performance of the Porsche 911 GT3 R: “The power is impressive; the entire event has been a great experience.” The Porsche 911 GT3 Cup also made a good impression: “The handling is fantastic and I had always wondered how late you could brake”, said Russian journalist, Vadim Gagarin. The difference in performance between the three vehicles was demonstrated by the three professional drivers in a one-round sprint, with Estre, Jaminet and Campbell accelerating simultaneously from the starting line. It was a close finish, but it was the Le Mans racer, the 911 RSR, that won, beating the specialist long-distance car, the 911 GT3 R, and the world's best-selling racing car, the 911 GT3 Cup. The new Porsche 911 GT3 R scored a place on the podium at its first outing in the Intercontinental GT Challenge. 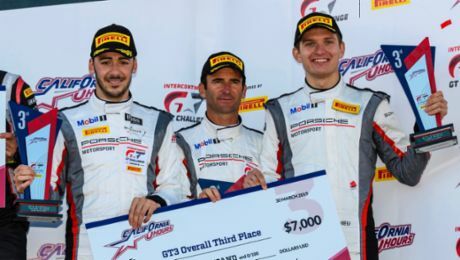 Intercontinental GT Challenge: Dirk Werner, Matt Campbell and Dennis Olsen finished in first place.